The glimpse of the heavenly adoration of God and the Lamb on the throne, transitions to a new sight: the breaking of the seals and the sealing of the people. Now comes the destruction, darkness and division over interpretation. It’s essential for us to remember that John is writing to the churches undergoing hardship and deepening persecution in Asia Minor. They need encouragement to persevere, to resist. They need to know that they’re not alone, that their church(es) is part of the larger Church. They are not alone. John writes them this pastoral letter of encouragement to spell out an ethic of resistance, a theology of perseverance. It’s not a secret code to decipher, but a word to strengthen, embolden, to invite to renewed hope in the new thing that God is doing even in the wake of the death of Christ. As John opened our vision of creation to include a glimpse of the heavenly court of worship, here he reminds us that the destroying power of evil in the world is not limited to particular people or humanity in general. 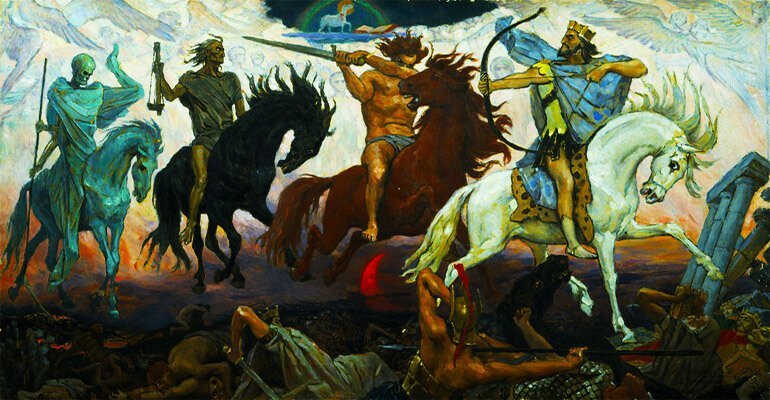 Like the four horseman of the vision the world then (and now) is afflicted with war and violence, hyper-inflation and famine, plague and death. No earthly power can stop those forces. Look at Syria. The proliferation of Nuclear Weapons. People dying from eating Romaine Lettuce. Black Plague in Madagascar. Famine in South Sudan and some parts of our city. Unclean water and financial profiteering off the backs of thirsty residents of Flint Michigan. The Lamb of God calls us to sing a new song (5:9), not only in the future heavenly realm, but here and now in the thick and thin of life, when it’s hard to live for Jesus. The destruction of chapter 6 is completed with the vision of radical salvation in chapter 7. Those who were deemed losers, suffered rather than renounce their faith in God, trusted in Jesus despite appearances, are welcomed into the space before the Throne: into the presence of God. They are given a new song to sing. New robes to put on. They are made into a new priesthood. The Lamb hopes for the conversion of the nations. It’s not about revenge, but justice. In the middle of this multitude there will be no more tears, wounds, broken bodies, bruised egos. Like God did with the Israelites in the desert, the Holy One will tabernacle, set up shop among us, moving into our neighborhood. It’s not merely a hopeful vision for the future, it’s a radical word of encouragement for the here and now. What shimmers for you in this reading? What’s the point of this vision? How does it relate to the vision of heavenly worship in chapters 4 & 5? John lifts God as the only true sovereign worthy of trust and worship, who tabernacles among us. How do you struggle with that (us) today?